The two tear sheets on this page were commissions from the Financial Times Magazine; How To Spend It.The first tear sheet is of Bel y Cías bespoke tailors, situated on the Paseo de Gracia in the cosmopolitan city of Barcelona. They handcraft elegant, made-to-measure clothing – each garment is literally a work of art. In order to create an image that captured both the manager and the environment in which he worked, Michelle photographed his reflection in a mirror in the store. A classic green jacket was shot as a product ‘cut out’. 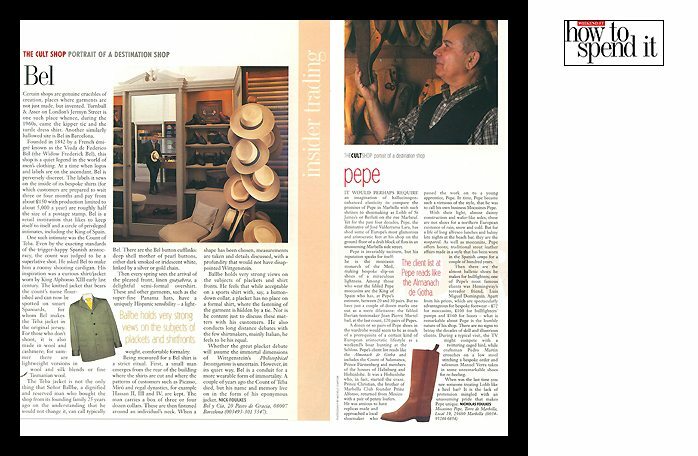 Tucked well away in the back streets of Marbella, you will find Mocasines Pepe, made-to-measure shoes for everyone from the bourgeois aristocrat to the Spanish bullfighter. Pepe has a passion for his work and in this portrait he’s happy and content at home, admiring his collection of wooden shoe moulds. Michelle finds this type of portrait photography particularly rewarding as the subject blends in so naturally with their surroundings.